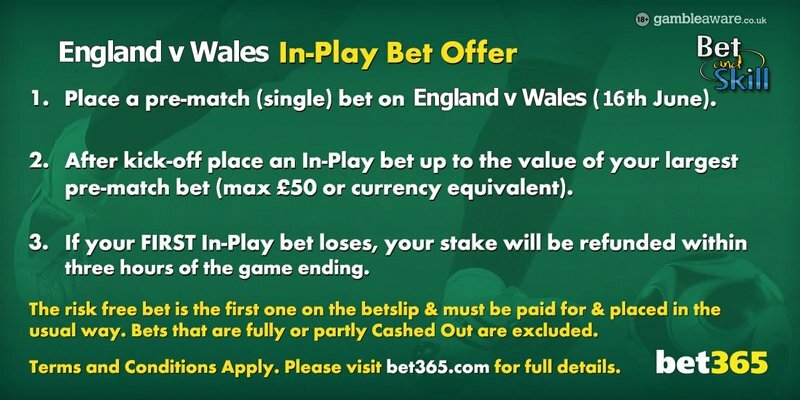 Football fans in England and Wales have had 16th June circled on their calendars for several months and bet365 are rewarding new and existing customers with a £50 free bet to use in-play on England v Wales! This is the usual Bet365's offer, the most appreciated by UK punters! The leading online bookmaker based in Stoke-On-Trent made this offer available for England's opening game against Russia and it came back to haunt them to the tune of £5million. But that has not stopped Bet365 from offering the £50 free in-play bet again on Thursday's England v Wales clash! Once the game has kicked off, go for a correct score at a bigger price. Eg: 2-1 England at 17/2. This offer applies to bets placed on the England v Wales Euro 2016 match, played on Thursday 16th June 2016. 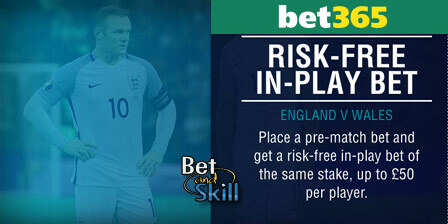 Risk free bet value will be equal to the stake of your largest pre-match single bet placed on the England v Wales Euro 2016 match, played on Thursday 16th June 2016, up to a maximum of £50*. Pre-match bets that are fully or partly Cashed Out will not qualify for the offer, whether Cashed Out pre-match or In-Play. The largest pre-match bet that has not been fully or partly Cashed Out will qualify (up to £50*). Risk free bet will be deemed your first single bet placed In-Play on the England v Wales Euro 2016 match, played on Thursday 16th June 2016. If your first single In-Play bet is fully or partly Cashed Out, you will no longer be eligible to receive this offer. Note that 'pre-match' is defined as bets placed prior to kick-off of the England v Wales Euro 2016 match, played on Thursday 16th June 2016 and 'In-Play' is defined as any bet struck after the game has kicked off. This offer is only available to customers residing in Great Britain. "Bet365 £50 free bet on England v Wales - In-Play Offer (Euro 2016 - 16th June 2016)"